What is the Age of Experience? How do we design it to shape a 21st Century Experienced Economy? We are living in a new world. In Senior Entrepreneurship: The New Normal (Oxford University Press, “Public Policy & Aging Report.” November 2014) I note that the world has changed for seniors and they, in turn, are changing the world. Today’s 50+ year-olds who have been given the gift of an additional 20–30 years of longevity and good health are keen to add meaningful life to those years, to remain self-reliant, and to give back to their work and communities. We 50+ year olds are all entrepreneurs designing our new lives through uncharted waters. It’s not as daunting as it sounds because programs, such as our Experience Incubator® are being designed to help people understand how they have been thinking and acting entrepreneurially all their lives: in their work; managing a home; raising a family; nurturing reciprocal relationships; and so much more and how to translate those skills to optimize their longevity. This longevity is historically unique. There is no blueprint for. what to do with an additional 20-30 years. 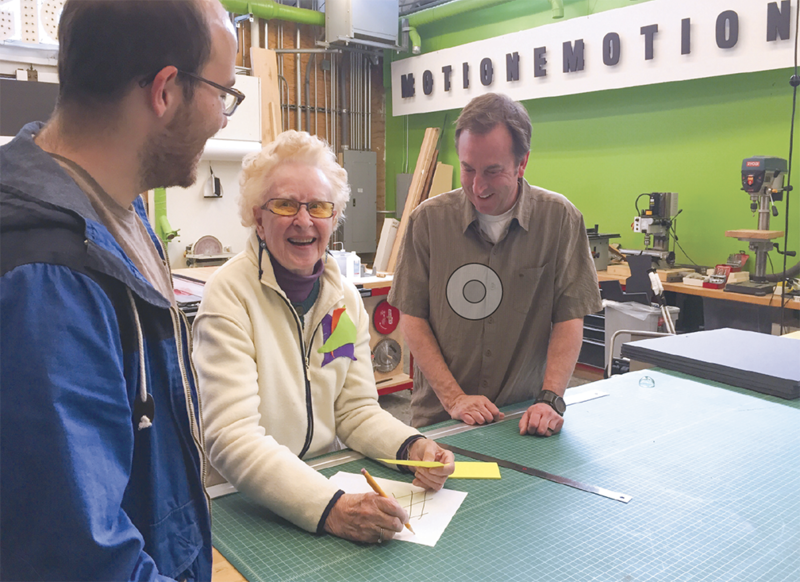 Seniors around the globe are designing their way into new lives, optimizing their life and work experience in non-traditional career paths and creating businesses of their own—from micro- to multimillion-dollar ventures. products to improve the quality of life for older individuals. Finland is the first country to declare experience is its number one natural resource! A recent study in Spain revealed that for every €1 the government invests to mitigate the “retirement syndrome,” it will receive a stunning €129 in return. In the US, the UK, Ireland, and Australia, 50+ year olds are launching more startups than any other cohort, and the EU has determined senior enterprise is key to achieving its 2020 economic strategic growth goals. Companies worldwide building multigenerational workforces are increasing productivity by a minimum of 20% and often significantly more. Even in Japan, where I’ve just completed a speaking tour sponsored by the US State Department, the Prime Minister has created a new initiative, “Agenomics,” (“Agenomics” is a term specifically coined by Japanese Prime Minister Abe Shinzo) to harness the knowledge and resources of the largest and fastest growing aging population in the world. 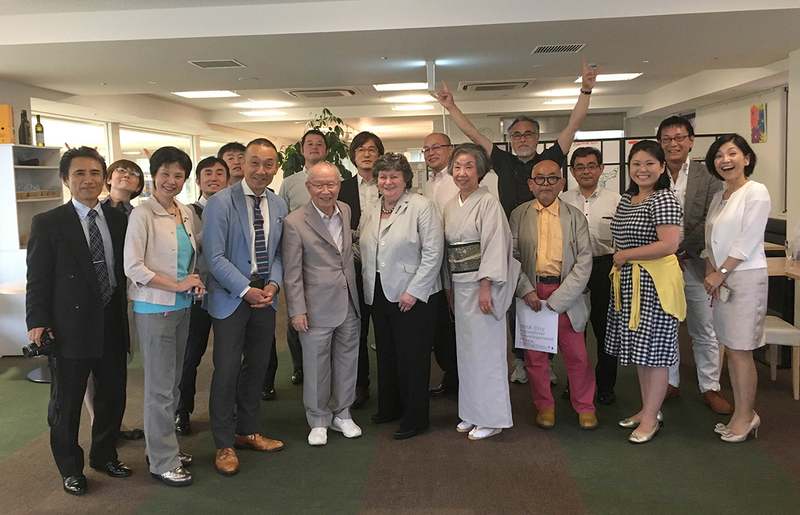 I met with more than 500 Japanese business, government and university leaders, and I was delightfully surprised at the number of university innovation centers, (public/private) business incubators, co-working spaces for startups and finance agencies to support older entrepreneurs in this traditional business economy where the mandatory retirement age is still 60.
standing to the left and right of Elizabeth Isele are the oldest and two of the most successful entrepreneurs in the Oita Startup Center. The 90+ year old gentleman saw a need for a local pharmacy in his neighborhood, and he launched one, and then another and then another. Today, he has sold those original pharmacies to a major conglomerate for a multimillion dollar deal. designing and producing kimonos, as well as repurposing the heavier, older, classic kimonos into other products. Albert Einstein said, “It’s a miracle curiosity survives formal education.” Contrary to the predictability of today’s tech-driven algorithms, which provide comfort to the more risk adverse Gen Z’s and Millennials, the experienced thrive on discovering unexpected pathways to simplify the complex and make unlikely connections work. Getting data is the easy part. The biggest challenge to identifying new ideas and creating new systems is analyzing, prioritizing and connecting all that information in new ways. It’s sad but altogether true that the young have little room to experiment today. In our society, youth even beginning in pre-school, feel compelled to exceed at all things so that they can attend the best schools and colleges. They avoid risk and experimentation because failure is not an option. Even more, when they graduate from college they are burdened with so much debt they still cannot afford risk. This is where experience is a huge asset. Older individuals are resilient. They have failed in countless ways over a lifetime and have overcome many obstacles. Their life experience of knowing what works and what doesn’t is a huge advantage over those who’ve spent little time testing new ideas. Experienced individuals are tired of hearing about the same old problems, and they are eager to actually solve those problems and more with new ideas and action steps to create prosperity for people of all ages. Gen Z and Millennials are motivated to do something about the status quo, but they often don’t know how and cannot afford to experiment. This is where catalyzing experience across generations is key to activating and sustaining social and economic change. Be it selling an idea, product or service, empathy is key. Remember what Maya Angelou said about her stories, “I’ve learned that people will forget what you said, people will forget what you did, but people will never forget how you made them feel.” The ability to sense motives and feelings of others grows stronger throughout life and enhances the ability to communicate effectively face-to-face as well as any form of social media. Combining the life/work experience of older individuals with the tech, social media experience of the young produces a catalytic effect and a distinct competitive advantage in today’s data driven, hyper complex, Internet of Things’ world. PulpWorks: “Molding a Better World” with eco-products made from “other peoples’ trash” in California, USA. Sooretul: An intergenerational entrepreneurship program advancing rural women farmers through e-commerce in Senegal. The Jelly Bean Factory: a father and son team in Dublin, Ireland, producing more than 12 million real fruit flavored gourmet jelly beans daily, have created the largest jelly bean business on the planet. The “Experienced Economy” movement has just begun, and we need more out-of-the-box creative, inclusive leadership, as well as ‘leading as if life matters’ to strategically support and advance this unprecedented demographic opportunity. the value of experience in entrepreneurial and intrapreneurially endeavors. ways to pair older and younger generations on teams. collaboration environments that break down traditional age hierarchies. GIEE empowers cross-generational experience through entrepreneurial thinking and acting to drive successful innovation within corporations, governments, education, and research to boost social and economic prosperity worldwide. 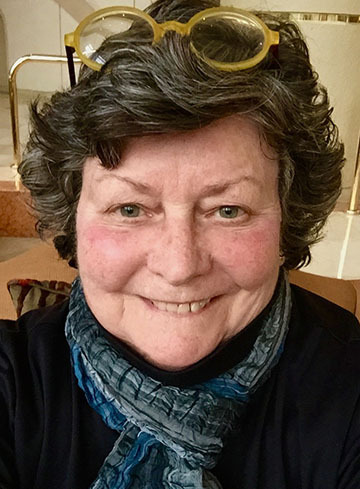 Elizabeth, who launched her entrepreneurship career after 30 years as an award-winning book editor, has become the go-to expert senior and intergenerational entrepreneurship for the White House, Congress, the State Department, the European Union (EU), and the Organization for Economic Cooperation and Development (OECD), as well as many other governments, universities and private sector corporations. Elizabeth launched GIEE at age 70+ and has, for the past four years, been crisscrossing the globe from Australia to Chile to Dublin to Istanbul and most recently Japan, convening forums among cross-sector thought leaders to raise awareness and ignite intergenerational experience, boosting employee engagement and new business start-ups. Her pioneering efforts to create an “Experienced Economy” by harnessing the human capital of older adults is catalyzing profound social and economic change. IDEO: is a global design company, who creates positive impact through design. Barbara Beskind: at age 92 designs product for an aging population, and she is not your typical Silicon Valley celebrity. At age 90, Barbara Beskind began working at IDEO, Silicon Valley’s cutting-edge design firm. Recognized worldwide as an occupational therapy pioneer, she has a wealth of experience to share. The young share their tech expertise and together they design products to improve the quality of life for older individuals.